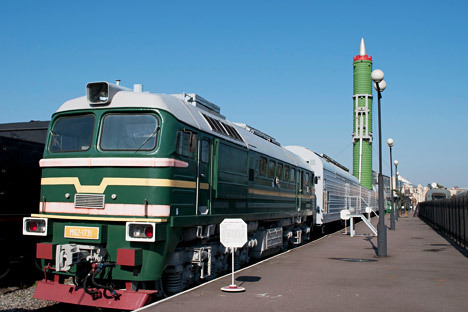 Russia will revive combat nuclear missile trains, a project called Barguzin, at a new technological level, commander of the Russian Strategic Rocket Forces (RVSN) Col. Gen. Sergei Karakayev said. The first regiment armed with the RT-23UTTH Molodets missile went on combat duty in October 1987. Source: Lori / Legion Media. "Of course, the revival of nuclear missile trains will take into account latest developments in the missile sphere. The Barguzin complex will exceed the potential of its predecessor in terms of accuracy, missile range and other characteristics, which will allow the complex to serve with RVSN for many years, at least until 2040," Karakayev said at a reception dedicated to the 55th anniversary of RVSN celebrated on December 17. "RVSN will thus revive the [land] missile group of three types - silo-based, road mobile and railroad, which proved its high efficiency in the Soviet era," he said. The Barguzin project is being worked on in line with the Russian president's orders, he said. The Moscow Thermal Technology Institute is responsible for the project which is being carried out in strict compliance with the approved schedule, he said. "Enterprises are currently working on the project design and creating test facilities," Karakayev said. The new missile complex "will embody the positive experience of creating and exploiting its predecessor, nuclear missile train armed with Molodets missile (SS-24 Scalpel)," he said.